Each year’s the same affair — we complain about the heat, the crowds and the overpriced food, but we find ourselves there anyway. 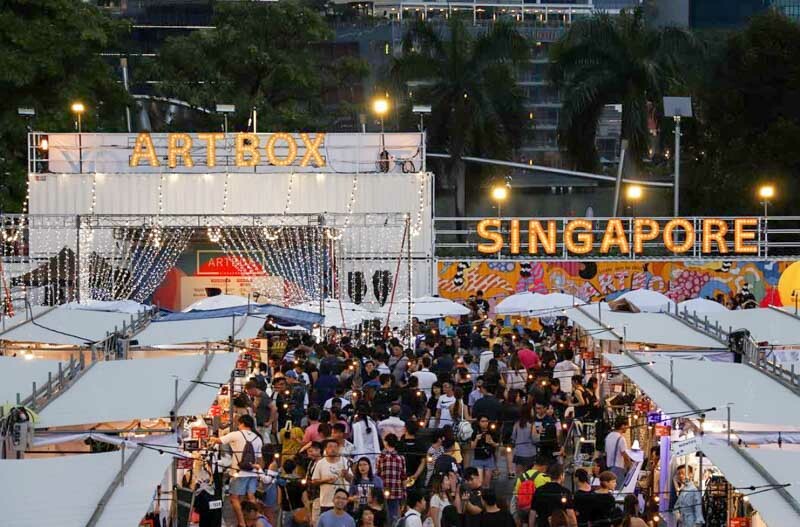 Yup, it’s Artbox Singapore I’m talking about. This year, we’ve decided to brave the crowd and checked out the local counterpart of Thailand’s famous market, that runs until 3 June 2018. I’ve picked out 10 food items worthy of the ‘gram, because you might as well make all the money you spent on them worth it right? Plus, if you didn’t Instagram your food then you didn’t really go to Artbox. Upon arriving, someone walked past me with this Crododo and Milkshake Combo ($15) and an instant “I have to get this!” rang in my head. It didn’t take many sleuthing skills to find Cereal Citizen, which was located just beside the open seating area. 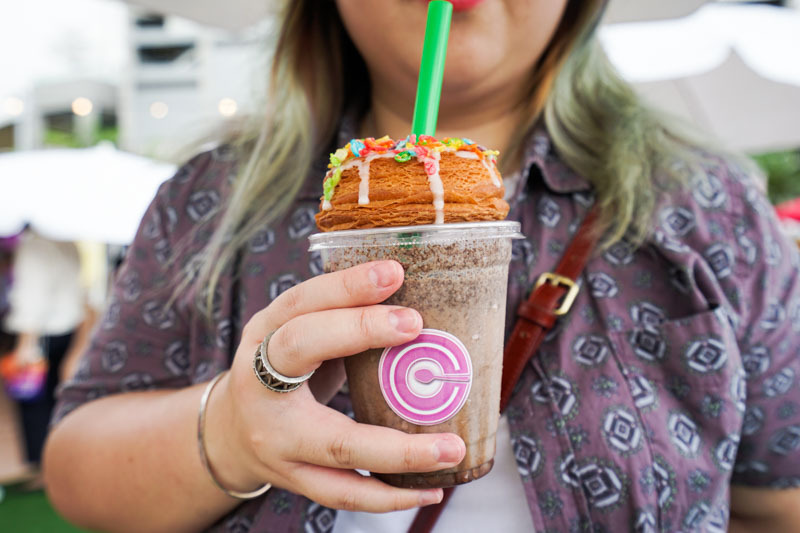 You’ll get to choose both your donut topping and milkshake flavour. 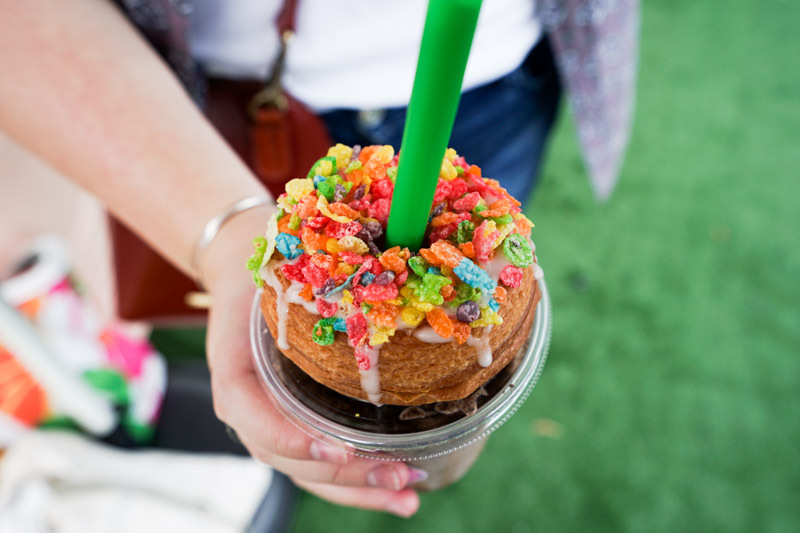 We went for the Oreo Milkshake, which was a supposed signature, and the fruity pebbles for that extra ‘gram factor. The donut was more of a flaky croissant, so that was pretty special. The milkshake, on the other hand, was average, and kinda took the ‘milk’ out of ‘milkshake’ because it lacked the thickness and creaminess of one. Call me ‘basic’, but I’m so helplessly in love with avocado. In a salad, sandwich or a drink, I’ve tried them all. but I certainly haven’t had them breaded and fried! 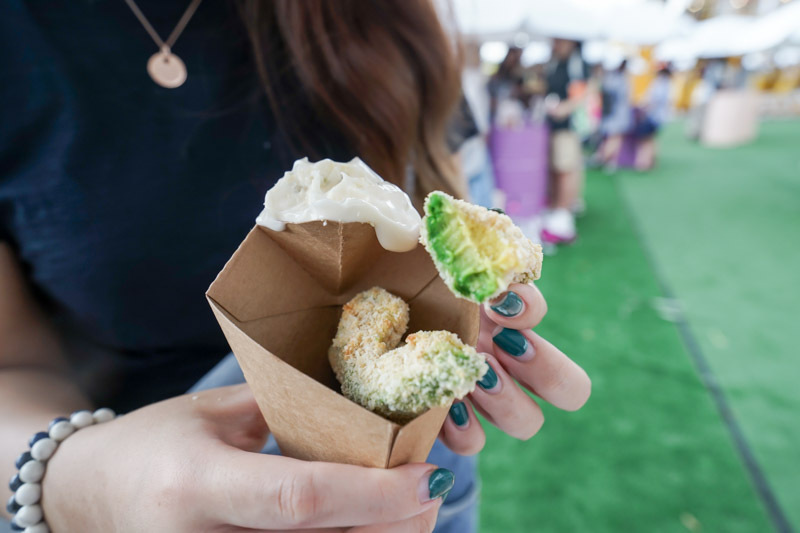 Hence, I obviously jumped at the opportunity to try these Avocado Fritters ($7.90) and I wasn’t disappointed. They worked pretty well with the tartar sauce, and you can tell within one bite that Zup! doesn’t kid with the quality of avocadoes they use. 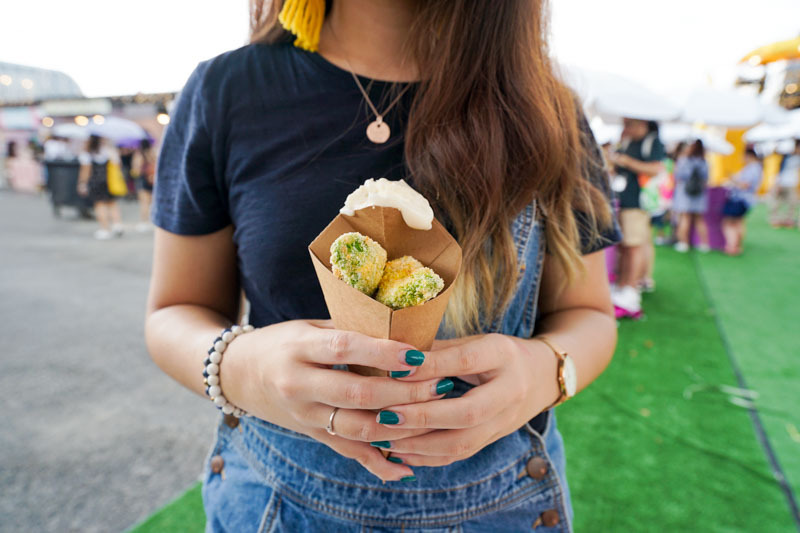 Crispy on the outside, soft and creamy on the inside, they’re what I call “feel-good” snacks, perfect to arm yourself with while doing your shopping. 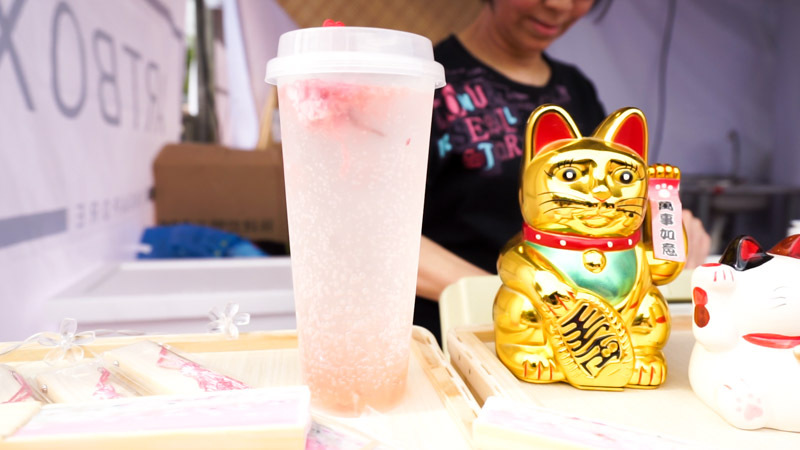 Our first source of hydration came from the Sakura Fizz ($6 for one cup, $10 for two cups). Every time I take on a Sakura-flavoured dish, I get confused because I admit I don’t exactly know how Sakura’s supposed to taste. 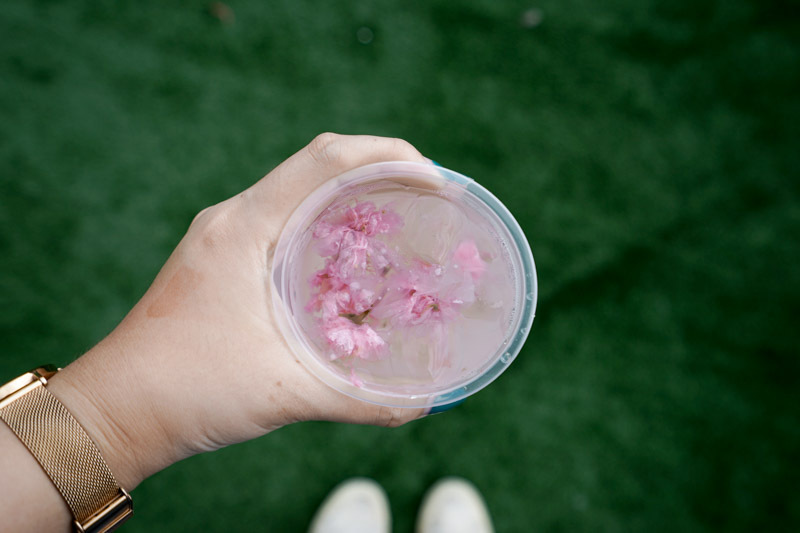 This surely is one photogenic drink, especially if you’re into pastels and florals. Consisting of edible flowers and soft pearls, the Sakura Fizz is a drink for both your eyes and tastebuds. It was fizzy with hints of citrus and a floral aftertaste, so what initially seemed like a gimmicky drink turned out to be something we’d actually order again. 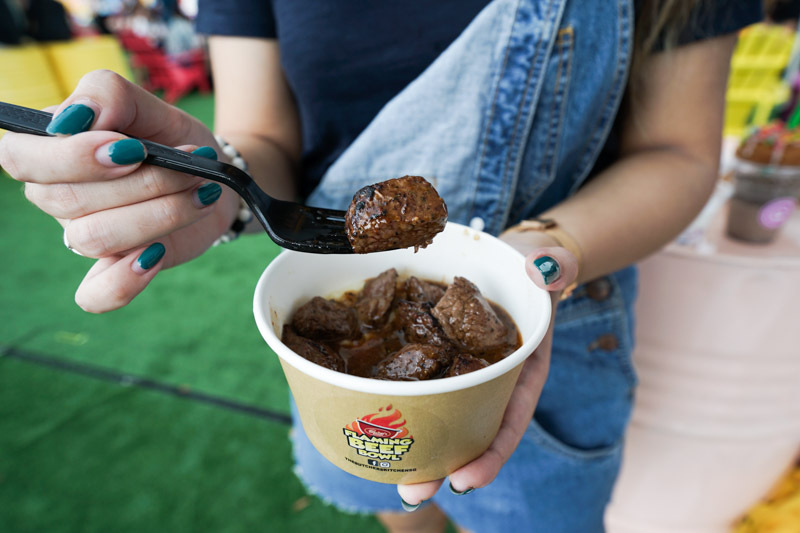 They seem to always be around, but who could bear to skip the delicious flamed wagyu beef? Of course, I just had to go all the way and got the Truffle Wagyu Beef Cubes ($12), which sat on a soft mash potato bed. The size of each beef chunk was rather generous, but whether they amounted to $12 is a question best left to you to answer. I was really looking forward to this, but was sorely disappointed when I realised that the folks at The Butcher’s Kitchen merely added one or two sprays of truffle oil over the beef before serving. This resulted in an elusive truffle taste, and left me a little annoyed at topping up the extra $2 just for measly truffle sprays. I should also add that there were traces of tomato in the broth, not really my cup of tea because I was expecting a savoury experience. I’m not sure if the name of this stall is a wordplay on the Mandarin word for hamburger, “Han Bao Bao”, but either way they dish out buns as cute as their stall name. 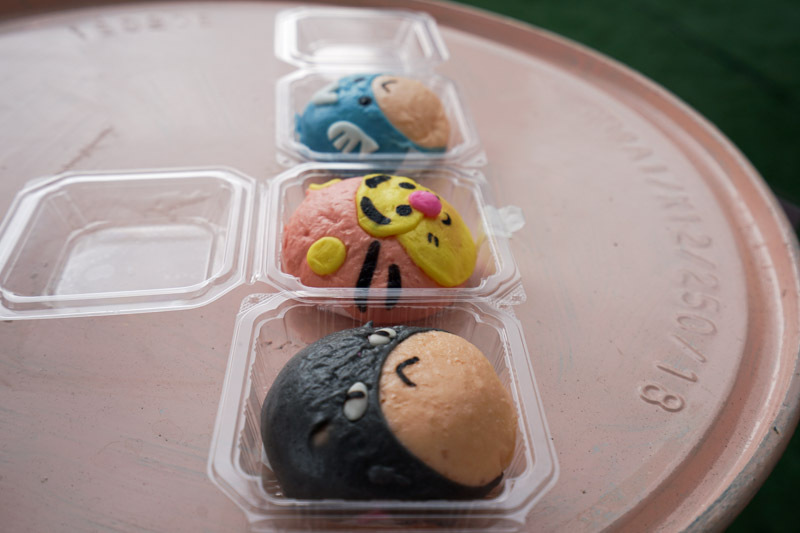 We couldn’t leave Artbox 2018 without getting our hands on these Character Custard Buns ($4 each, $10 for three). 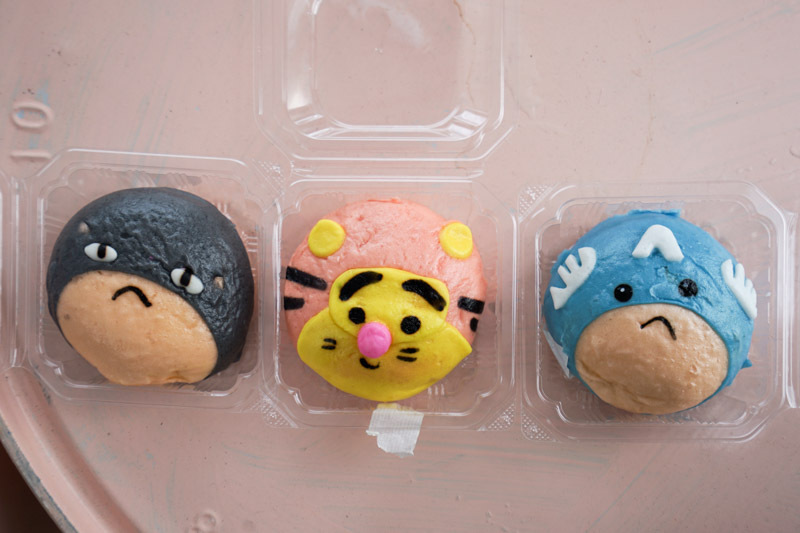 The Infinity War craze has left us drawn to this bao version of Captain America, and we chose Batman to be fair to all the DC fans reading this too. Tigger was just, well, adorable. Unfortunately, the goodness stops merely at their exterior. What was supposed to be milk custard on the inside turned out to be a dry, sticky mess that was unevenly distributed throughout the bun. Overall I’d say 8/10 for novelty, 2/10 for taste — you have been warned. 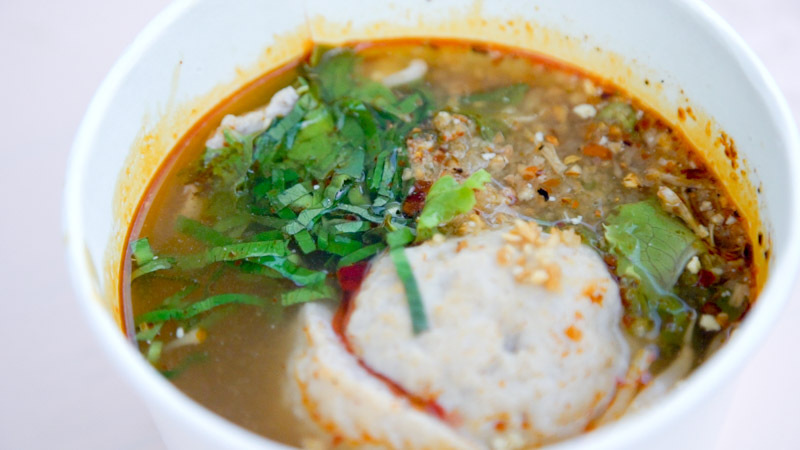 We spiced things up with the Tom Yum Jumbo Pork Ball ($6), paying tribute to Artbox’s Thai roots. 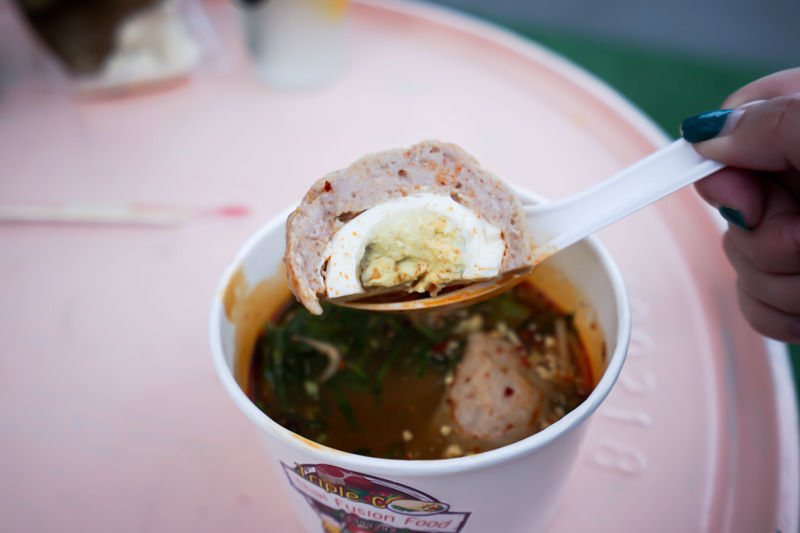 The pork ball itself was probably the size of my fist, but whether minced pork and an egg was worth $6 was questionable. We didn’t find the Tom Yum soup spicy, so that’s good if you don’t do too well with the red, peppery fruit. The soup tasted more like it came from a pre-made stock rather than homemade, but was made fragrant due to the garnishing on top. 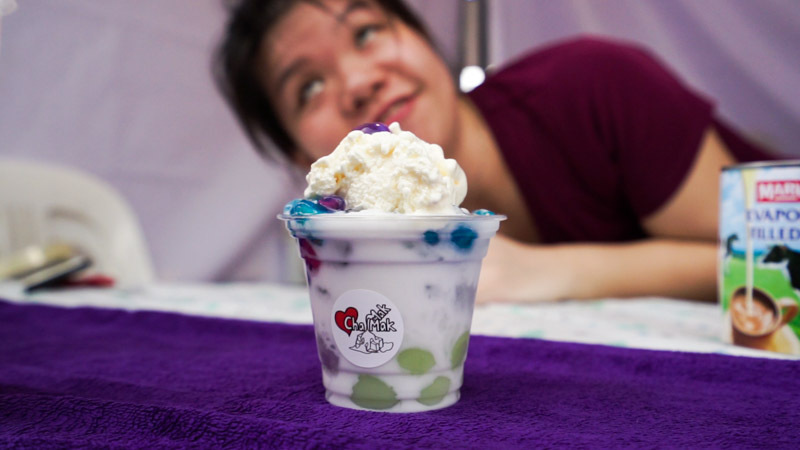 The Ruby Booby Deluxe ($6) was a coconut-ty delight, with taro balls and red ruby bits. 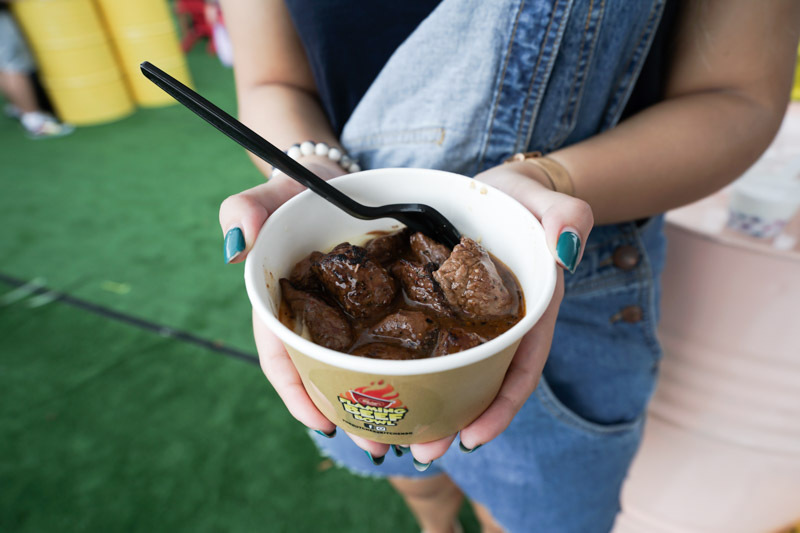 The little red ruby pieces offered us a nice crunchy texture against the smooth, creamy soft serve that sat atop this dish; a nod to the Thai dessert. It was a party for our palates at first, but it soon became a disaster when the ice cream started melting and spilling all over my hand. If you’re getting this, remember to stomach it real quick because it just becomes an overly sweet mess once it’s melted. The sweltering heat and strong flavours from all the other food left us pretty thirsty, so imagine our delight when we spotted this Lemon Soda ($3.90). 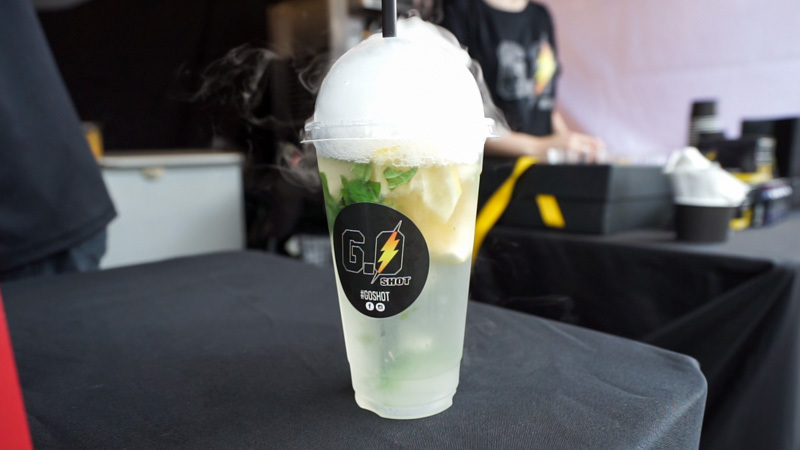 Mint leaves and lemon all in one drink certainly spell ‘refreshing’ to me, and not to mention that it smokes too! I highly recommend this if you need a quick and affordable pick-me-up. It comes in two other flavours: Sour Plum and Soursop. 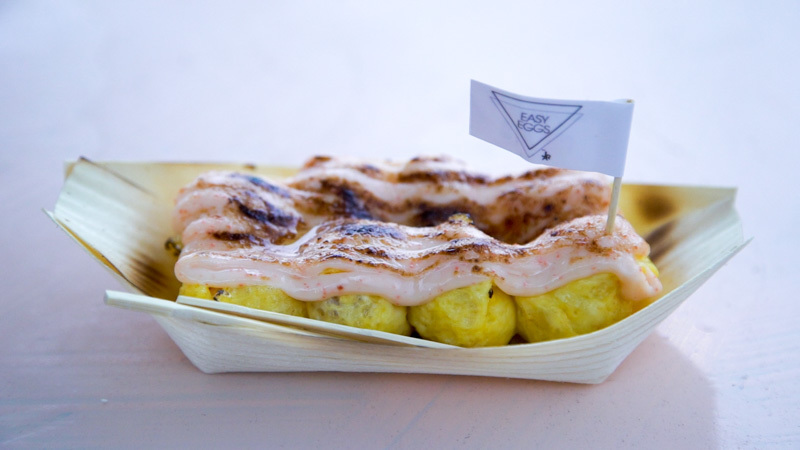 This torched goodness was the Mentaiko Quail Eggs ($6.90), but I personally prefer to call it the “egg on egg on egg”. If you think about it, the roe from the Mentaiko are technically eggs, and the quail’s eggs are wrapped in a layer of fried eggs, hence earning it its triple egg title. The creaminess of the savoury Mentaiko paired with the tiny eggs so well that I unknowingly downed half the dish on my own. I’d advise you to share it if you don’t want your cholesterol levels to skyrocket. Health reasons aside, this was the winning dish for me, partly because of how affordable it was too. Looking for an ice cream fit for a king? 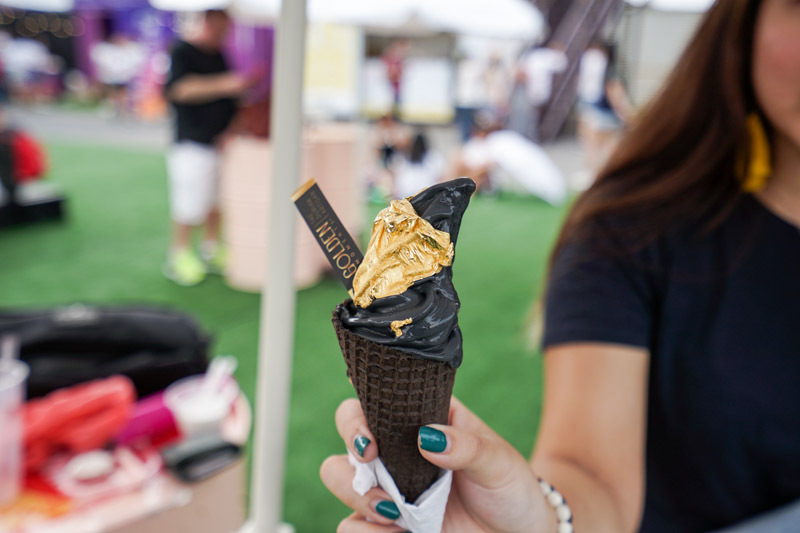 Here’s the 24k Gold Mao Shan Wang Ice Cream ($9.90) that sure looks the part. I don’t even like durian, but this was heavenly. 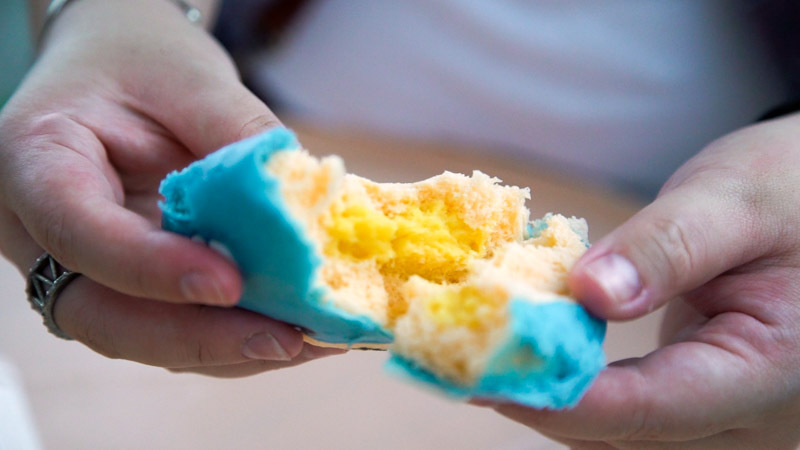 It boasted rich, fragrant flavours of the durian, and is surely a dish for all Mao Shan Wang lovers to die for. Though it doesn’t get my feet tapping like the Bruno Mars single, it’s worth a shot if you want that regal touch to your feed. Well, I guess that’s it from my trip to Artbox Singapore 2018, and I hope that you’ll have as much fun hunting for pretty dishes as I did. But if you’re the kind of person who prefers to avoid all the gimmicky stuff and go for what gives you a bang for your buck, then there’s always the good ol’ burgers and Thai milk teas. I’ll be back again next year and as always, I hope that each year will supersede the last.